Whilst feeling deeply thankful in those quiet baking and cooking moments. When extra good warm thoughts swirl about. I gave away several of my big beloved fairy tale pumpkins, with a card on how to roast them tied on. I decided not to be pumpkin greedy. You see, I can be really pumpkin greedy. But I knew there were others out there. Others I had waited to collect for Thanksgiving. A sort of thankfulness ritual in it all. My thankfulness cup runneth over in so many ways. Too many to take today at once. Even though I took many. Before the first freeze they have to come in. But for now, for now we roast. Fairy tale pumpkins are amongst the best best best for eating. Fairy tale pumpkins are not very fibrous or stringy. And, oh so orange, you gasp at first sight of the flesh. Your hands get stained orange as you cut it up, it's wonderful. Did I mention they are candy sweet? To roast just cut in big wedges. Put foil on a cookie sheet with rim edges, or a shallow roasting pan. Place pumpkin on foil lined sheet face down. Pour a cup of water into the baking pan around the pumpkins. Then bake for 1 hour at 375' F, or until tender. Cool for an hour, then scoop off the flesh from the skin, and puree for baking or soup. You can also cut up the raw pumpkin in pieces and cook into your own dishes. I roasted mine for pies and breads. Meanwhile our big guy was roasting, I went to check out today's loot. Pumpkin season was good wasn't it? Funny enough, it was the first year I just turned on irrigation and sprinklers and let the garden mostly do its own thing. Thankfully, the garden was okay without me 24/7. Boy, I had sooo many lessons this year. By the by, as I was looking at the pumpkins the sky began to turn pink. That beautiful pink over snow dusted mountains. I collected some rosemary to place around the chandelier. I dug into old trunks for family heirlooms. I love using old loved items for Thanksgiving. I found a table cloth that fit swell, made by my very beloved grandmother ages ago. When she was just a girl. I adore the little edging. I ran out and tried to get some pics of the boys with the pumpkins before I brought them in. No one was game, so I have about 40 weird pics. His eyes are so dark in the shade, and so caramel in the sun. It got dark so fast. So, I decided to get ahead of myself for once. Maybe do all my baking and chopping. Maybe have less to do on Thanksgiving day, what a concept? The warmth in the heart. The scent of the season. Pumpkin pie and pumpkin cheesecake. I asked Mister Lovee which one he wanted. Can I have one of each? So, the dessert is done. The potatoes are cooked and just need butter, milk and mashing tomorrow. 2 pumpkin breads are in the oven. In the a.m. I will work on stuffing/dressing, veggies and turkey. I look forward to it so. I see every single day as a gift. I am thankful for every breath. Life is fleeting, and there is no time to waste. Every moment is a chance to love, laugh, be. I read something a woman wrote, I am not sure where? But she said, "I would decorate for the holidays even if I was the last living person on earth." Doing nice things, like decorating for holidays, or even for no reason at all is grand. It can be applied to every single day. It's the point of doing things for yourself. Even just setting a nice table. There doesn't have to be a reason, except that it makes us happy. Sharing it with others is just a bonus. That's the type of thinking that motivates me to try to live my life to the fullest every day. To do things, just because they make us happy. I think that type of outlook shows our thankfulness to be alive. I am thankful for sooo many things. Big, small, tiny, microscopic, enormous, huge, furry too. I am thankful for here. For you being out there. For being like minded, and taking the time to stop in from time to time. Happy Thanksgiving, it's a beautiful day. Much love to all my friends out there, even the quiet ones. What better than them in their very best, in a piece of art? Matty and Miles in art, hooray! This is a piece by Kimberly Wlassak of Gerushia's New World. She makes wonderful art, and by the by, she is having a fab black friday sale. 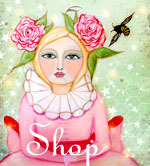 You can visit her shop here.